The United States Golf Association Museum in Far Hills, N.J., held a special event on Wednesday, May 27, to mark the opening of the Jack Nicklaus Room. The new room, which celebrates the life and career of the 18-time major champion, joins galleries that honor Bob Jones, Ben Hogan, Arnold Palmer and Mickey Wright. The 1,200-square-foot exhibit space contains more than 80 artifacts, many on loan from the Jack Nicklaus Museum in Columbus, Ohio. From his first U.S. Open victory in 1962 to his last Green Jacket in 1986, Nicklaus had the skill and the determination to compete more successfully than anyone else in golf’s major championships. He compiled the best amateur record since his hero, Bob Jones, capped his career by winning the Grand Slam in 1930. Nicklaus won two U.S. Amateurs and played on two victorious USA Walker Cup Teams. He turned professional in November 1961 and embarked on a career that included 73 PGA Tour victories and a record 18 major championship titles. He won a record-tying four U.S. Opens, six Masters Tournaments, three British Opens and five PGA Championships—an amazing testament to his three decades of sustained excellence. Nicklaus did not become golf’s greatest major champion on ability alone, however. His competitive spirit, self-belief, commitment, integrity, perseverance and vision were among the values that helped turn his unquestioned skills into unmatched success. Nicklaus used this 3-wood from 1958 through 1995 and won all 18 of his professional majors and both U.S. Amateurs using it. In an effort to jump-start his game, Nicklaus switched to this putter before the 1967 U.S. Open. It was painted white and the round grip was altered with a pencil jammed into the end of it. He made eight birdies in a final-round 65 to win his second U.S. Open. Nicklaus won seven major championships and hit two of his most memorable shots with this 1-iron: the 238-yard approach to the 72nd hole at Baltusrol in 1967 and the tee shot at the 71st hole at Pebble Beach in 1972. Nicklaus won his 18th major championship at Augusta National in 1986 at age 46. The victory was unforgettable, not only because of his final-nine heroics, but because his son Jackie caddied for him. Coming off an eagle at 15, Nicklaus hit a 5-iron at the 170-yard 16th. As the ball was in flight, Jackie yelled, “Be right!” and Nicklaus said, “It is,” as the ball rolled back to within 3 feet, setting up a birdie. Jack and Barbara Nicklaus were married on July 23, 1960. Nicklaus has said that Barbara has been his foundation, his voice of reason, his biggest supporter, his best friend and the love of his life. 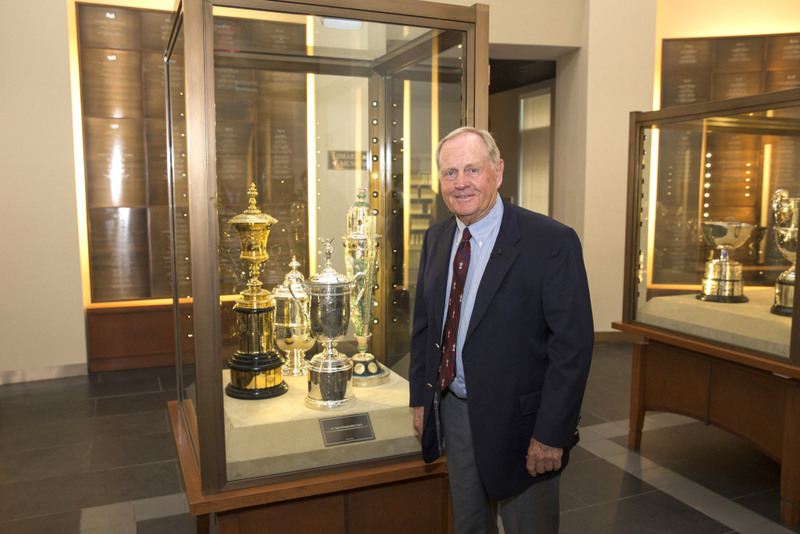 • The Jack Nicklaus Room is 1,200 square feet and contains 82 artifacts. • Some of the artifacts on display in the room are on loan from the Jack Nicklaus Museum in Columbus, Ohio. The USGA expressed its appreciation to the Nicklaus Museum for its support and looks forward to continued collaboration. • Six themes are highlighted within the room: competitive spirit, integrity, self-belief, commitment, perseverance and vision. Though these attributes are not unique to Jack, the USGA said it believes the way he related to these principles make Nicklaus golf’s greatest major champion. • There are nine short films and 27 “Ask Jack” vignettes highlighting Nicklaus’ four U.S. Open victories and the themes discussed above. Additionally, the USGA created a timeline, a statistics page and an interactive course-design feature that gives visitors insight into Jack’s design philosophy and lets them create their own risk-reward par 4 by choosing the routing, and placing bunkers and the green. • Two works of art were commissioned for the room: a painting by Harold Riley titled A Study of Jack Nicklaus I, depicting Nicklaus at Pebble Beach in 1972; and a sculpture by Zenos Frudakis titled Jack Is Back, showing Nicklaus celebrating a birdie putt on the 71st hole of the 1980 U.S. Open at Baltusrol. • The room is meant to be an intimate examination of Jack and his career. The room explores the moments, people and events that shaped and influenced his life. By having Jack speak in the first person to the visitor, whether through written words or interviews, the USGA hopes it is a deeply personal experience for everyone. • In addition to the exhibits in the room, the short films will be shared through USGA digital media channels in the coming months to reach a worldwide audience. The goal of these videos is to share Jack’s success, both on and off the golf course, with future generations. • The architect of the project is Gensler. The exhibit designers are 1220 Exhibits and Peter Hyde Design. For more information about the USGA, visit www.usga.org. . For more information on the Jack Nicklaus Museum, visit www.nicklausmuseum.org.